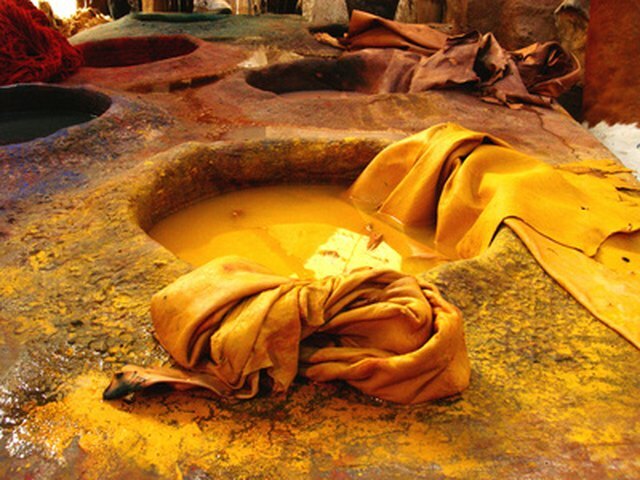 People have been making natural fabric dye for centuries. Long before there were chemical dyes, people made homemade dye for fabric using natural plant products. From mulberries for dark purple to the deep brown from walnut hulls, nature provides a rainbow of dye materials. Homemade dye hues can range from soft to vibrant, depending on the plant and the time that you soak the fabric. Many quilters use natural dyes to produce authentic colors for reproduction quilts, and others simply enjoy the process of creating a custom look to fabric, no matter what the final use will be. Chop your plant material into small, uniform pieces. Place 2 cups of the plant material into a heavy pot, and add 4 cups of water. Place the pot on a stove burner. Bring the water in the pot to a boil, then turn down the heat so that the water is simmering. Simmer the water and plant material for one hour. Remove the pot from the stove. Strain the dye water through a colander to remove the leftover plant material. Return the dye to the pot. Make a dye fixative for your fabric to make sure that the color will not wash out. If you are using berries for dye, mix 1/2 cup of salt with 8 cups of water. For other plant materials, mix together 2 cups of vinegar with 8 cups of water. Place your liquid in a pot, along with your plain fabric, and simmer for one hour. Remove the fabric from the pot after simmering and rinse it in cool water. Wring out the fabric to remove any excess moisture. Submerge the damp fabric in the dye liquid and simmer it on the stove until you reach the desired color. The longer that you leave the fabric in the dye, the stronger the color will become. For extra-vivid colors, remove the pot from the stove after an hour and allow the fabric to soak in the dye overnight. Remove the fabric from the dye liquid when you have obtained a color that you like. Wear rubber gloves to prevent the dye from staining your hands. Rinse the fabric under cool water until the water runs clear. Hang the fabric to dry. Use natural fabrics like cotton, wool or linen for the best results. Wash dyed fabrics separately and in cool water.